So what does all this have to do with this adorable houndstooth mug cozy? Well somewhere in between curling her hair into the 1980’s Princess Diana hairdo and transitioning my now brother-in-law out of his signature bright yellow Yoplait t-shirts into something more presentable, my sister became obsessed with houndstooth. She also had a thing for navy and white. Houndstooth is classy, elegant and classic. 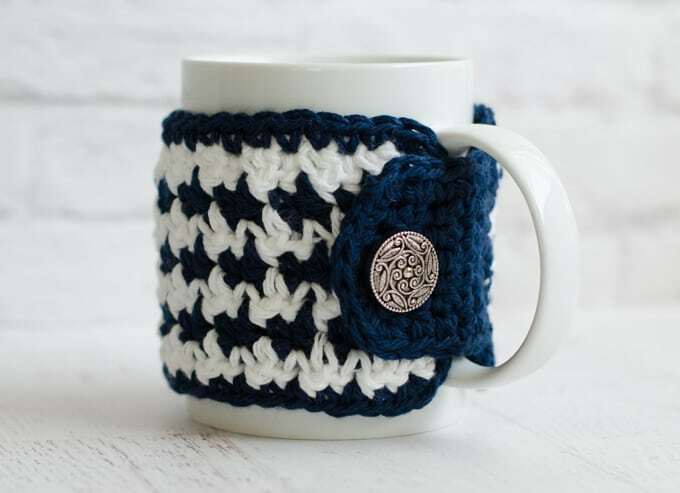 It says, ‘I don’t care how awful your day is… I got this.’ And so, when you’re feeling like a hot mess, just grab this coffee cup cozy, pour yourself a cup of deliciousness and wrap your hands around that mug of warm goodness. Take a deep breath…and let it out. You’ve got it together, my friend. Finished size: About 12″ long by 3″ tall. Fits standard 10-11″ circumference mug. R3-7: Continue row 2 for a total of 7 rows, changing color every row and changing to blue in the very last stitch. Note that the double crochets sit on top of the single crochets of the row before and vice versa. R8: Sl st in the first 3 st, ch 1, sc in the same st, sc in the next 5 st. Leave remaining unworked. R12: ch 1, turn. Sc in first 2 st, ch 2, skip 2 stitches, sc in last 2 stitches. R14: ch 1, turn. Sc in ea st. Do not fasten off. Rotate work to work edging. I love seeing your finished projects! If you share your Houndstooth Mug Cozy on Instagram, be sure to tag me @crochet365knittoo. If you are on Facebook, stop over to the Crochet 365 Knit Too Facebook page and share a photo! I’d love to see your work! Written pattern copyright Cheryl Bennett 2018, all rights reserved. Please do not reprint or repost this pattern. 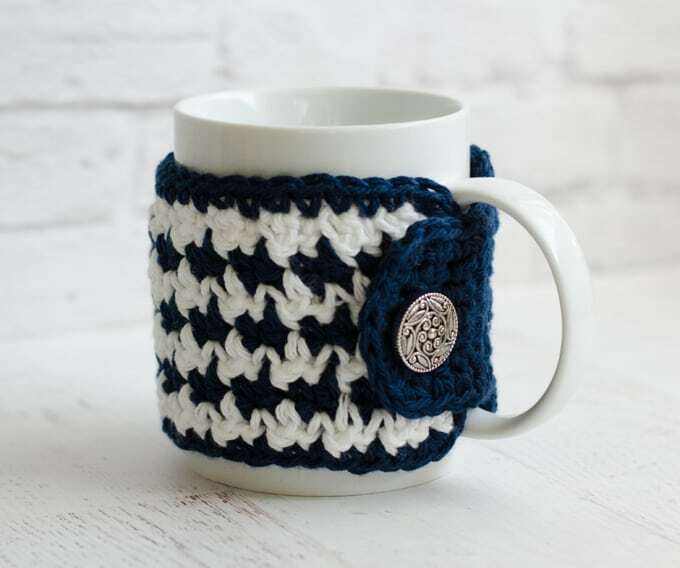 If you would like to share this Houndstooth Mug Cozy pattern with others, just link to this page. If you’d like to make items for sale from this pattern, please visit my About page for more information.